Abu Dhabi (WAM) — The Information Affairs Office of Sheikh Sultan Bin Zayed Al Nahyan, Deputy Prime Minister, has issued a documentary study on the tour by H.H. 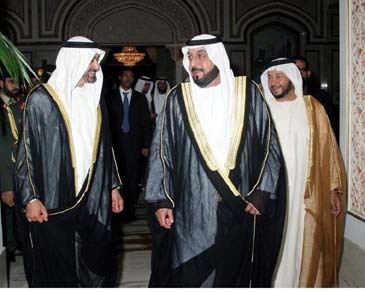 President of the State Sheikh Khalifa bin Zayed Al Nahyan to Egypt, France, and Morocco. During this tour, which took place from July 15 to July 25, H.H. President met with H.E. President of Egypt, Mohammed Husni Mubarak, H.E. President of France, Jacques Chirac, and H.M. King of Morocco, Mohammed VI, the study says. The study asserts that the tour represented a turning point in relations between UAE and these three countries, as it deepened the friendly ties and cooperation with them, and provided high levels of consultation and coordination in various domains. The tour also provided the leaders with an opportunity to exchange views over several Arab, regional and international issues of common concern, notes the book . During his talks with the leaders of countries visited, the book maintains, Sheikh Khalifa voiced keenness to promote peace and love among nations, and reject violence. He further stressed the need to resort to dialogue as a means of settling crises and problems, especially under the current circumstances experienced in the Arab and international arenas, particularly the new developments in Palestine, Lebanon and Iraq. The study points out that the President expressed his hope for widening the scope of partnership between UAE and the countries he visited in all fields, especially in investment, economic, commercial, and scientific domains. UAE President HH Sheikh Khalifa returns home on Aug. 14 after visits to France, Morocco and Egypt. Abu Dhabi (WAM) - President H.H. Sheikh Khalifa bin Zayed Al Nahyan returned on Aug. 14 to the country following state visits to Egypt, France, and Morocco Sheikh Khalifa discussed with the leaders of the three countries ways to boost bilateral relations and the latest developments in the Middle East. He was received at the airport by Sheikh Sultan bin Zayed Al Nahyan, Deputy Prime Minister, General Sheikh Mohammed bin Zayed Al Nahyan, Abu Dhabi Crown Prince and Deputy Supreme Commander of the UAE Armed Forces, Sheikh Saif bin Mohammed Al Nahyan, Sheikh Suroor bin Mohammed Al Nahyan, Sheikh Hazza bin Zayed Al Nahyan, Sheikh Hamed bin Zayed Al Nahyan, Chairman of Abu Dhabi Planning and Economy Department, Sheikh Dhiyab bin Zayed Al Nahyan, Chairman of Abu Dhabi Water & Electricity Authority, Sheikh Omar bin Zayed Al Nahyan, Aide de Camp, Sheikh Mohammed bin Khalifa Al Nahyan, Chairman of Abu Dhabi Finance Department, Sheikh Mohammed bin Butti Al Hamed, the Ruler's Representative in the Western Region of Abu Dhabi, Sheikh Ahmed bin Hamed, the President's Special Advisor, Sheikh Nahyan bin Mubarak Al Nahyan, Minister of Higher Education and Scientific Research, Sheikh Sultan bin Tahnoun Al Nahyan, Chairman of Abu Dhabi Tourism Authority, Abdullah Al Masoud, Speaker of the National Consultative Council, Sheikhs, ministers and senior officials. Sheikh Khalifa was accompanied during his visits by Sheikh Mansour bin Zayed Al Nahyan, Minister of Presidential Affairs and Sheikh Sultan bin Hamdan Al Nahyan, the President's Advisor.